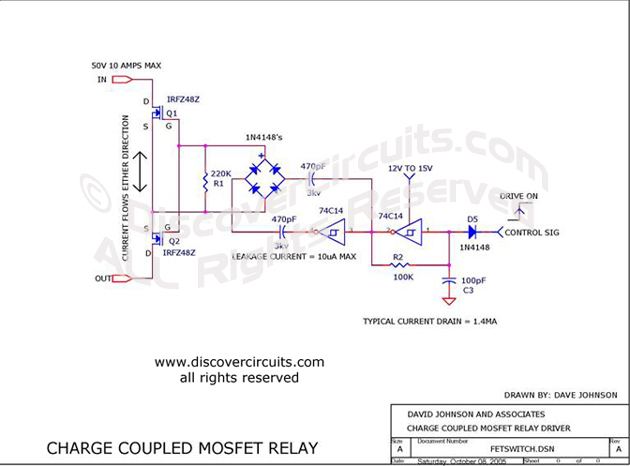 Circuit: Charge Coupled MOSFET Relay__ Circuit designed by David A. Johnson, P.E. Text & Graphics Copyright © David A. Johnson, P. E. -- ALL Rights Reserved.. This circuit acts as an AC/DC relay with a rating up to 50 volts peak and up to 10 Amps of current. The differential oscillator supplies voltage to the gates of the two FETs with good isolation will drawing only 1.5ma of current.